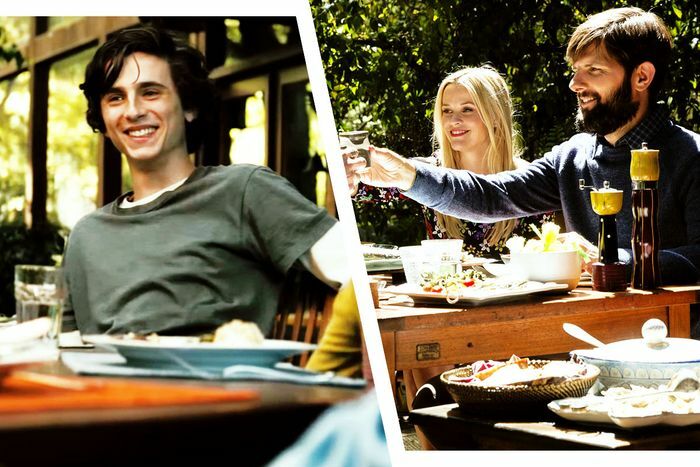 In contrast to Beautiful Boy’s tender, serious subject matter — Timothée Chalamet and Steve Carell star as a father and son reckoning with the latter’s drug addiction — the family’s home is a bright, ebullient space. The house has expansive floor-to-ceiling windows, mosaic tile on the open kitchen’s countertops. Nic’s bedroom is like an artistic hideaway; David’s office has photos of his family in between photos with famous interview subjects. It’s so Nancy Meyers–adjacent that it almost doesn’t track: This seems like the fantasy home for a budding artist, not a place to house his anguish. And somewhere between Chalamet’s devastating performance and the movie’s outrageous music cues, Big Little Lies viewers might feel a tingle of recognition: Isn’t this the house where Bonnie (Zoë Kravitz) and Madeline’s ex-husband Nathan live? It is, confirms Ethan Tobman, Beautiful Boy’s production designer. Tobman was hesitant to take on the Big Little Lies house, but felt the space was perfect for his interpretation of the real-life Sheff home, which he visited. “In my design approach to the house, the goal was to accurately portray their family dynamic, and their architectural choices, but also the feeling we had when we were there,” he said. “This was a home we would have loved to have grown up in, progressive, artistic, encouraging self-expression, intellect, freedom of personality, and yet Nic Sheff found it impossible to deal with reality on a day-to-day basis.” Tobman talked to Vulture about finding and using that Calabasas house. This might seem random, but was that home used on Big Little Lies? Was it the same as Zoë Kravitz’s character’s house? It was! It’s where Zoë Kravitz’s character lived. We were nervous about the similarities, but I believe Big Little Lies had already come out by then. I watched it like a hawk! The house doesn’t appear frequently, and when it does, it’s mostly at night. On the one hand, it wasn’t a conscious choice to avoid what they shot, but on the other hand, we naturally were changing the areas that were focused on in Big Little Lies, so I think it feels like a pretty different home in the end. Yeah, I agree. I really only noticed it in the patio scene. I was like, That’s the patio where Reese Witherspoon threw up! That’s right, yeah. The one place where we didn’t really do much of any modifications is that patio area. I was shocked when I learned that most of the movie used soundstages, since the house feels so alive and real. Why was that? Our schedule logistically required us to have soundstage use. We had too many scenes to shoot in the house, we needed day and night to switch quickly, and we had an enormous amount of work that needed to be done. We felt a house was going to be too spatially prohibitive, and also financially prohibitive — renting a house for that period of time, with that many crew — we’d have damages, etcetera. So how did you find the Big Little Lies house? Our excellent location manager, John Panzarella, found it. It had a really unique layout, very open architecture that invited the outside in, but also had a darkness, a lot of dark wood, and a lot of progressive, highly educated, Northern California sentiments, or sentimentalities that were not similar to the Sheff’s in details, but they were similar conceptually. We went about converting the home on location to look a little bit more like the Sheff’s home. To had break up the wood, which would have been too monotonous onscreen, we introduced color, and introduced the art projects. We replaced all the counters with a mosaic found objects, tile, and broken glass, that Karen would have done herself.